A rendering of the 29-story condo tower proposed for Jewelers Row showcases a more traditional historic brick façade at its base topped by glass-framed condo units offering prospective buyers views overlooking Washington Square Park. 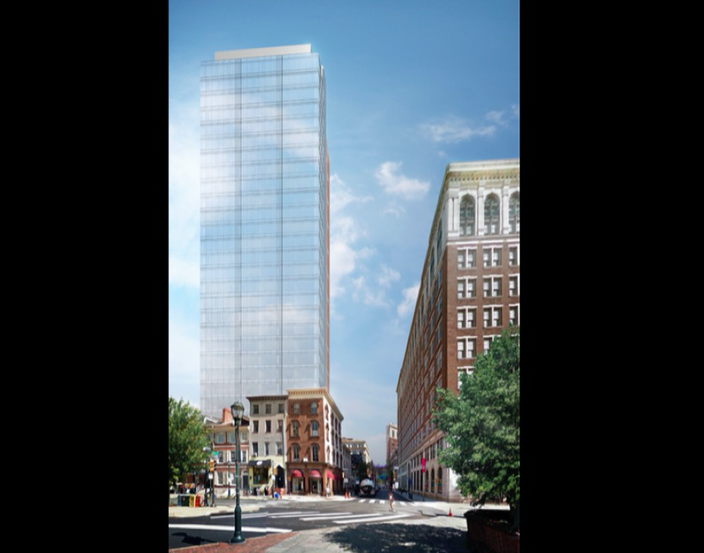 The developer behind the controversial Jewelers Row condo tower presented the public with a first glimpse of the 29-story building plans during a Washington Square West Civic Association meeting on Tuesday evening. Based on the renderings and a report by PlanPhilly, the Seventh and Sansom street building will feature a four-story, street-level brick base, meant to complement the current diamond district streetscape, topped by 25 additional glass-framed stories of residential condo units offering prospective buyers optimal views overlooking Washington Square Park. 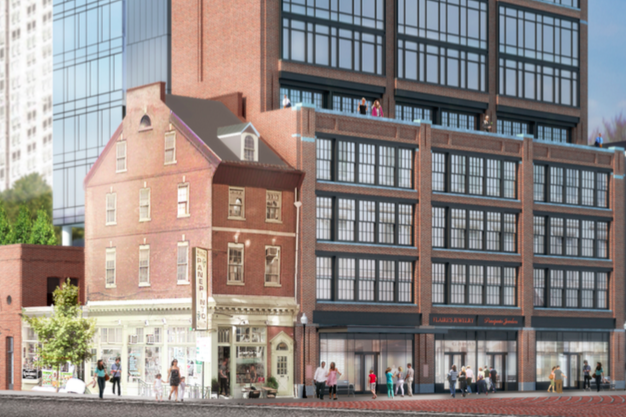 The ground floor will house 2,600 square feet of retail space, enough for “three to five stores,” Brian Emmons, vice president of the development company, Toll Brothers’ City Living Division, told PlanPhilly. More than 100 condo units spread throughout its 29 stories will sit on top. Jewelers Row condo tower renderings show glass-walled units that will offer prospective condo owners clear views of Washington Square Park. The developers are hoping their plans, including the decision to include street-level aesthetics that will blend in nicely with the diamond district, will quell any remaining fears and opposition. 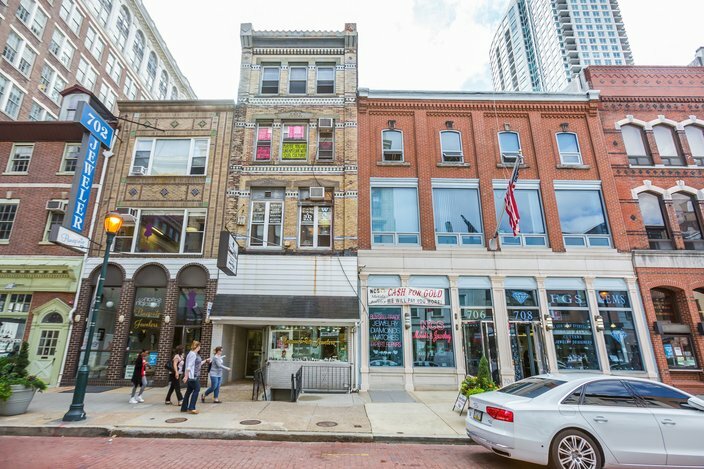 In November, Toll Brothers, based in Horsham, Montgomery County, obtained the permits to demolish several properties on Jewelers Row (as pictured below) to make room for the new project. Buildings on south side of Jewelers Row that may be subject to demolition due to an impending development, Oct. 21, 2016.